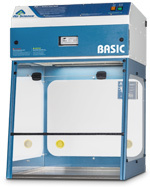 The Purair® Basic ductless fume hoods are designed to provide high level performance features at an affordable price. 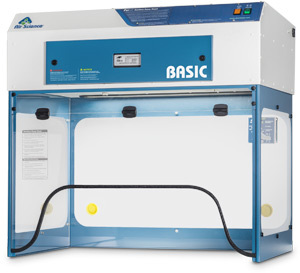 Purair Basic ductless hoods are found in research laboratories, educational facilities, and forensic laboratories throughout the world and are designed to protect the user and the environment from hazardous vapors generated on the work surface. 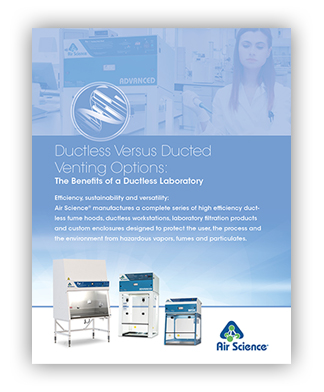 At the heart of the Purair fume hoods product line is the innovative Air Science® Multiplex™ Filtration Technology that creates a safe work environment over the widest range of applications in the industry. 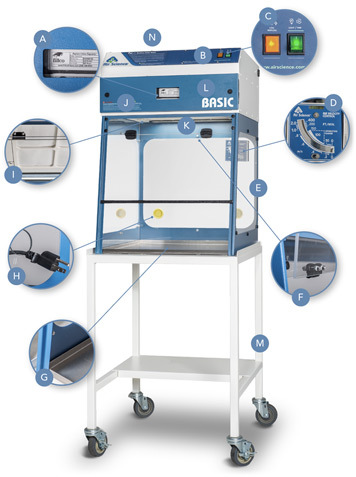 Purair Basic ductless fume hoods and chemical processing workstations are available in 3 standard widths, 2 depth options, in metal or polypropylene construction, totaling 12 standard models. 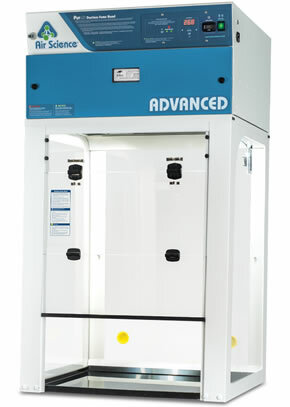 Protects the operator from fume and (with added HEPA/ULPA filter) particle hazards. C. Airflow Alarm: Low airflow alarm continuously monitors filter loading and alerts user when service is needed. D. Air Velometer: An optional analog air velocity meter is positioned in the user's field of vision. Purair P5-24-XT, shown with optional mobile cart. G. Work Surface: The internal work surface can be fitted with an optional polypropylene (available in white and black) or stainless steel tray; see accessories. K. Dynamic Filtration Chamber: The dynamic filter chamber prevents any possible leakage of contaminated air by pressurizing the fan plenum (positive air) and depressuring the filter compartment (negative air). L. Internal Manual Speed Controller: Authorized personnel may set the EC blower speed as desired. M. Stand: Optional mobile cart with locking casters. 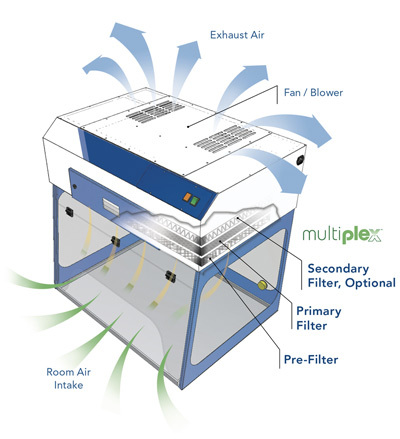 N. Safety Filter: The optional carbon or HEPA/ULPA safety filter adds an additional layer of protection. Construction: All models are available in either metal or polypropylene construction. See selection chart for specifications and dimensions. Specify metal or polypropylene when ordering. Available in 110V, 60Hz or 220V, 50Hz models. Steel Support Frame: The chemical resistant epoxy coated steel frame adds mechanical strength. Optional all polypropylene construction is available if desired. 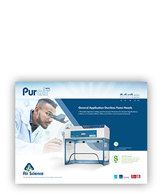 Learn more about the Purair Basic ductless fume hood line by downloading the brochure or by visiting our Specifications tab that includes information for each model.